RollerMouse is an innovative alternative to a computer mouse. They come in a variety of different designs, though the principal behind them all is the same. Its ergonomic design places cursor control just below the spacebar of any keyboard making data entry faster, safer, and more comfortable for right- or left-handed computer users. The Contour RollerMouse is an innovative alternative to a computer mouse. Its ergonomic design places cursor control just below the spacebar of any keyboard. The Roller Bar moves the cursor by sliding left to right, up and down, and diagonally. Pressing the Roller Bar performs single click operation. When you use the Contour RollerMouse, your hands and fingers stay on the keys... no more awkward or uncomfortable reaching for a mouse, so decreasing the possibility of RSI strain, which often originates from the shoulder. 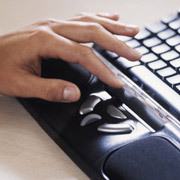 Also the RollerMouse's built-in ergonomic palm supports provide optimum comfort and safety. The RollerMouse can be controlled with thumb or fingertip motion using either hand, and cursor control is placed where it makes sense; just below the spacebar of your keyboard. Programmable buttons and a scroll wheel speed up repetitive functions, and optical technology ensures precise control of cursor movement. 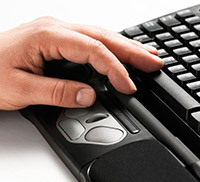 The RollerMouse enhances your current keyboard, and is supported by virtually all computer operating systems with no software drivers to install. And for people who just can't give up their current mouse, the RollerMouse includes a PS/2 port.